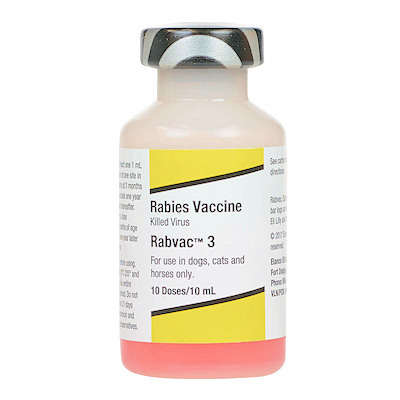 Rabvac 3 (Elanco) is a killed Rabies vaccine labeled to administer to horses (2 ml) dogs (1 ml) and cats (1 ml). For dogs and cats 3 months of age or older give a 1 ml dose IM or Subq. Revaccinate 1 year later and the every 3 years thereafter. Syringes and needles are not included.